Prime Minister Shinzo Abe said Monday the government will raise the consumption tax to 10 percent from the current 8 percent as scheduled in October 2019 to help finance ballooning social security costs after twice delaying the hike. Chief Cabinet Secretary Yoshihide Suga said Abe instructed relevant ministers to come up with measures to mitigate the negative impact of the tax hike. The increase was originally scheduled for October 2015 but was postponed due to concerns that it would dampen consumer spending and hurt the economy. Abe made the announcement during an extraordinary Cabinet meeting where a supplementary budget of around ¥940 billion for fiscal 2018 was approved to promote reconstruction in areas hit by torrential rains, earthquakes and typhoons earlier this year. The last time the consumption tax was raised — to 8 percent from 5 percent in 2014 — Japan went through a brief recession, but the government sees another hike as indispensable to pay for growing medical and nursing care costs due to the rapidly graying population. 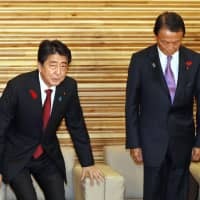 Although the hike this time entails a 2 percentage point rise, “we, based on the lessons we learned from the previous 3 percentage point increase, will do our utmost to minimize a negative impact on the economy by implementing all sorts of policies,” Abe told an emergency meeting of his Cabinet on Monday evening. Earlier in the day, Suga said that aside from tax breaks, the government will “map out various measures” to offset a projected drop in consumer spending caused by the hike. But at the same time, Suga hinted the government is not entirely ruling out the possibility that it may postpone the unpopular move after all. The long-held government stance that the hike may be shelved in the event of an economic crisis as serious as the Lehman Brothers collapse “remains the same as ever,” he said. “We will go ahead with the hike unless an event with the magnitude of the Lehman Brothers shock happens,” he said. The increase to 10 percent is the second stage of an overall hike from 5 percent, based on an agreement in 2012 between ruling and opposition parties at the time. Part of the expected revenue from the tax increase will go to expanding child care support, including preschool education, which Abe pledged to do while campaigning for the 2017 Lower House election. Abe, who secured another three-year term as president of the ruling Liberal Democratic Party last month, has repeatedly said the government will increase the consumption tax next year unless serious economic turmoil occurs. The decision comes after he apparently judged that households can withstand the tax hike while the economy is expanding. The government will introduce a reduced tax rate of 8 percent on daily necessities, including food and newspapers but excluding dining out and alcoholic beverages. As a way of alleviating any adverse impacts on businesses, the government is considering subsidizing small and medium-size retailers to refund 2 percent of consumers’ purchases in the form of reward points for a limited period in case of payments through cashless means such as credit cards. Finance Minister Taro Aso, speaking to reporters Monday evening, said that “no (further) details have been fleshed out so far,” including whether the 2 percent refund will apply to goods whose tax rate will remain at 8 percent, such as food. In a bid to balance out an expected surge in demand ahead of the tax hike and a plunge afterward, the government plans to expand tax breaks and subsidies for pricey purchases such as cars and homes. Those measures are expected to be incorporated into the ruling bloc’s tax reform outline to be compiled in December and the government’s draft budget for fiscal 2019. The consumption tax was raised to 5 percent from 3 percent in April 1997. It was hiked to the current 8 percent in April 2014 under the Abe administration. 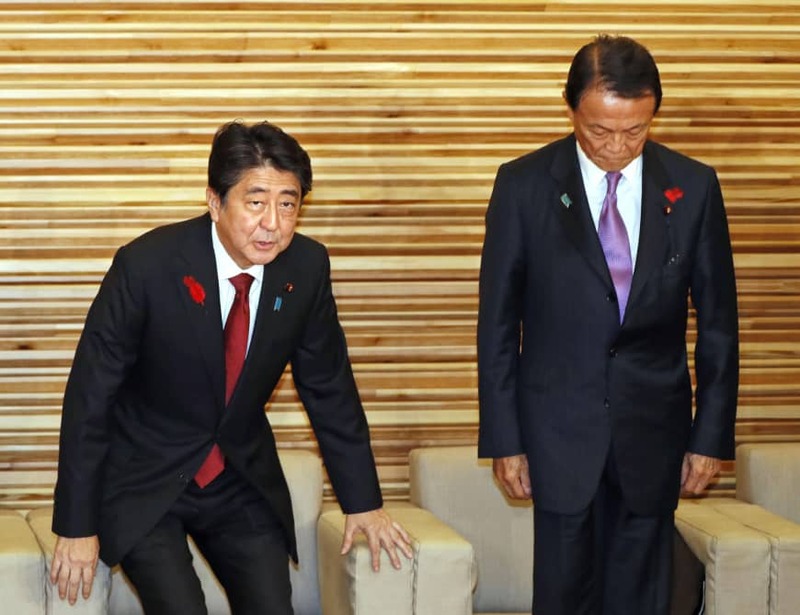 Although the coming planned increase to 10 percent has been treated as the second of a two-stage raise from 5 percent, Abe pushed back the schedule twice, first from October 2015 to April 2017, and then to October 2019. Restoring fiscal health is seen as an urgent yet difficult task for the debt-ridden country, given that the rapid aging of the population means swelling social security expenses such as medical costs and pensions. As Abe decided to review the allocation of the revenue from the envisioned tax hike with an increased focus on child care support, he delayed the target for achieving the country’s fiscal rehabilitation goal to fiscal 2025 from fiscal 2020. As for the supplementary budget, Aso said it will be aimed at facilitating efforts to reconstruct areas ravaged by quakes and typhoons. It will also be used to renovate increasingly derelict concrete-block walls lining school roads and to install air conditioning in public elementary schools, he said. He said there is no telling at this point whether a second supplementary budget will be necessary.